Creating pages in history, Mercedes-Benz holds a remarkable name in creating armored vehicles. Recently we have seen Stuttgart preparing and bringing in market some armor-plated models via its distinct program. 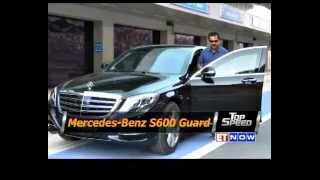 Now here we are in the year 2015 with their all new Mercedes-Benz S-Class S 600 Guard 2015. Let us have a close look at this new armored-vehicle adapted from Mercedes S 600. 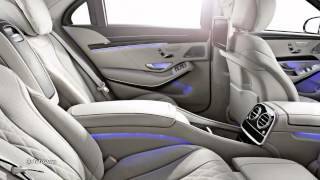 Interior of Mercedes-Benz S-Class S 600 Guard 2015 is luxurious complimenting its protection standards. This all new limousine offers you enough of space at the rear with adjustable head restraints for people in front. However the rear passengers get treat through the executive rear seat with heating and massage functions and simultaneously also availing leg rest and cushion bag. Company also gives you an option to choose between two or three seats to be fitted at rear. Talking about more in technology, rear compartment comes with business console which transforms the entire rear cabin into your office featuring touchscreen and hands-free telephony. Apart from these there are numerous options you can go for like, opaque roller blinds, automatically activated fire extinguisher, reading lamp etc. 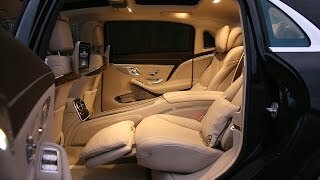 Exterior of Mercedes-Benz S-Class S 600 Guard 2015 at first will look similar to the S600 but this we believe is a positive aspect as much of difference would announce the vehicle being an armored vehicle or a VIP taker and thus will grab attention. However beneath its outer black body, drastic changes reside or say the major quality that differentiates this from rest in kind. 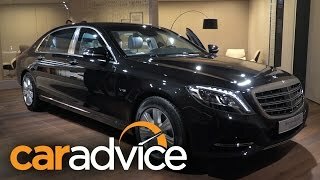 Mercedes-Benz S-Class S 600 Guard 2015’s entire structure from top to bottom is strengthened to keep the safety intact. To create the protective elements, fitted between outer shell and structure, special steel is used. Windows or say parts covered with glass come with polycarbonate coating while PE components and special aramid gives extra protection to rest of the body. In short hearing from company the Mercedes-Benz S-Class S 600 Guard 2015 can withstand anything from bullets to explosive devices fired close to vehicle. Mercedes-Benz S-Class S 600 Guard 2015 is mounted with a 6.0 Liter V12 Petrol engine delivering 523 hp and peak torque of 830 nm paired to 7G-TRONIC automatic transmission. Being heavy in comparison to the normal S600, the top speed for it comes to 130 mph, 25 mph lesser than base model and this is understandable.